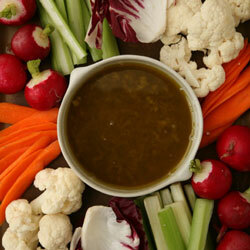 Bagna Càuda: Bagna càuda is a warm dip typical of Piedmont, Italy, but with numerous local variations. Bagna càuda is served and consumed in a manner similar to fondue. The dish is eaten by dipping raw, boiled or roasted vegetables, especially cardoon, carrot, peppers, fennel, celery, cauliflower, artichokes, and onions. It is traditionally eaten during the autumn and winter months and must be served hot. Wash and prepare the vegetables several hours before using them. Cut vegetable into strips about 3 inches long and 1/2-inch wide. Par boils1/4 of the vegetables; roast 1/4 of the vegetables. Place rest of the vegetables in ice water to crisp. In a large heavy saucepan over medium-high heat, add cream and garlic cloves. Bring just to a boil, lower heat to medium, and cook, stirring constantly to prevent scorching or boiling over. It takes approximately 15 minutes or until the cream has thickened and reduced by half (approximately 1 cup). In another saucepan, melt the butter and olive oil. Mash anchovies with a fork. Add the anchovies to the melted butter, along with cayenne pepper. Cook until the anchovies dissolve into a paste, about 5 minutes. Put the reduced cream, garlic cloves, and anchovy mixture into a blender. Purée until the mixture is very smooth. Serve Bagnacàudain warming dish over candle (a fondue pot works well). Dip vegetables into the Bagnacàuda (a fondue-style fork will help). If sauce begins to separate while standing, a few turns with a whisk will bring it back together. Sauce may be made ahead and kept refrigerated in covered jar. To re-warm, place jar in cold water in a pan and gently raise the heat until mixture is liquid again. Remember, this is a dip for vegetables freshly picked at the peak. Use only the youngest, sweetest variety of them as possible, and before serving pat all the vegetables dry with a towel.